"With great power, comes great...wait, what?" While it is true that the most famous quote from Spider-Man lore is not spoken in the film, you do get the sense that it is felt throughout the plot. There were many who felt it was too soon for a reboot of the Spider-Man film franchise. I was one of those who felt that way. But I am glad that I was proven wrong. "The Amazing Spider-Man" is not a perfect movie, no. But it is a really good movie. The plot, like "The Avengers", was cookie-cutter. Common gets power, has to defeat villain who gains powers as well, saves day. But that is okay. It's the little things in between that which make this film very good. Lets start off with the main characters, beginning with the star, Peter Parker. Portrayed by British actor Andrew Garfield, the Peter of this new series is a stark contrast to the one portrayed by Toby Maguire. A little more buff, but lean, and frankly more attractive, Garfield gives Peter a lot more depth and emotion than Maguire ever did. We see Peter have a wide range of emotions, from funny, geeky, and goofy to awkward and angsty, and finally angry and sad. The only problem I had with his emotional gestures was that Garfield seemed like he was almost "tweaking" when he was upset or nervous, almost like he had a neurological tic. Also, when he got his powers he wasn't necessarily cocky, but almost asinine and off-putting. Otherwise he showed great range. Garfield was also able to show Peter as an actual genius, with the wide array of gadgets he created himself, including a mechanical lock on his bedroom door, turning his cellphone into a police scanner, and of course, his nifty new web shooters. 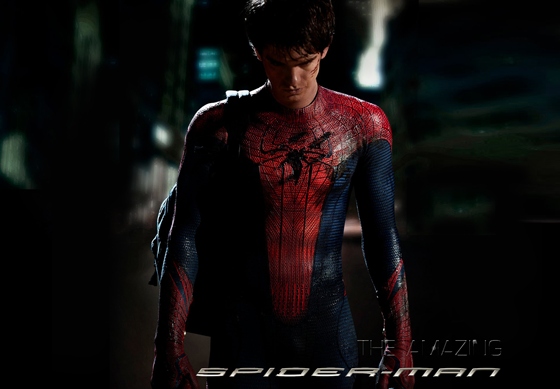 His web shooters are especially cool as he created the webbing based on a design he got off the Oscorp website. Also they sound mechanical, and flash everytime they discharge (that sounded wrong...hehe.) Garfield's Spidey suit has grown on me, as I disliked it very much. But as time went on, it started to seem logical, and watching him shop online for "ALL SPANDEX" was quite funny. Plus showing him using household materials to create his gear (taking the lenses out of his sunglasses for the eye pieces) was cool to watch. It makes him seem like the Peter Parker we've waited to see. Emma Stone was pitch-perfect as Gwen Stacy. As the original Spidey Love Interest from the comics, it felt right to have her be Peter's first love. The scenes between the two were easily some of the strongest of the movie, especially watching Gwen be calm and collected compared to a nervous and twitchy Peter. Their chemistry seemed organic and real. Plus, Emma Stone is freaking hot! So that helps. Having them also be academic rivals with Gwen being almost as smart as Peter is a nice touch, as it gives them something in common that they could turn to as conversation starters. Denis Leary portrayed her father, Capt. Stacy, and he did an admirable job. All those years on "Rescue Me" seemed to help bring out the irish law enforcement mentality in him. He wasn't perfect, but he was really good. I personally did not care for Rhys Ifans as Dr. Curt Connors. His character almost seemed to be a carbon copy of the Norman Osborn character from the Sam Raimi films. This includes motives, delusional tendencies, and strive for quick yet dangerous results. His transformation to the Lizard was also very...ehh. I just didn't care for it. In the comics, the Lizard is a carniverous beast that doesn't usually keep his intelligence, unlike in this movie. The CG work on the lizard also seemed lackluster, but it wasn't the worst I've seen (Green Goblin Power Ranger suit, anybody?). I believe most of Connors' arc was to set up the inevitable Norman Osborn reveal, who is *SPOILER ALERT* revealed to be dying, which is why Connors was working on his research for Oscorp in the first place. Overall, The Amazing Spider-Man was a really good movie. Worth seeing in 3D? I don't know. I would advise against it seeing as it wasn't originally filmed that way. I did thoroughly enjoy this movie, and would advise you to go see this movie if you want an enjoyable time at the theater, or just need to escape the hot summer heat! Final Score: 8.5 out of 10.